Cham Cham: Chomchom, cham cham, or chum chum is a traditional Bengali sweet that is popular in Bangladesh, India, and Pakistan. It comes in a variety of colours, mainly light pink, light yellow, and white. 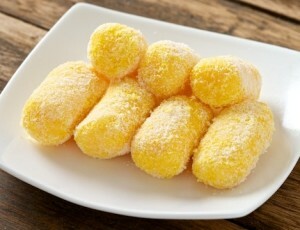 It is sometimes coated with coconut flakes as a garnish. The main ingredients for cham cham are flour, cream, sugar, saffron, lemon juice, and coconut flakes. Boil the milk on medium heat. Remove the boiled milk from heat. Stirring continuously, add in the lemon juice 1 teaspoon at a time. Stir, till the all of the milk curdles. Strain the milk curds in a muslin cloth. Wash the chenna (milk curds) under running water, to remove the sourness of the lemon. Press to remove the excess water from the chenna. Take the strained chenna in a bowl. Add in the corn starch and yellow food colour. Mix well, to make a smooth dough. Divide the chenna dough into 8 equal parts. Roll each chenna dough part into an oval shape. Mix 2 cups sugar with 4 cups water, in a pressure cooker. Boil the sugar-water mixture on high heat. Add the rolled out chenna balls, one at a time, to the boiling sugar-water mixture. Cove the pressure cooker without the pressure weight. Remove the cover of the pressure cooker. Cool the cooked cham cham to room temperature. Refrigerate the cham cham for 3-4 hours. Remove each cooled cham cham from the sugar syrup and roll them in the dried shredded coconut. Serve mouth watering cham cham, chilled. If you have any queries regarding the Cham Cham recipe, please leave a comment.